29.7 x 41.5 cm. ‘Rainbow’ screenprint on white stock. Exceptionally scarce, around 120 copies were produced. Martin Kaye was an Englishman who served as a signmakers apprentice and then studied serigraphy in Japan. Arriving in Amsterdam in 1968 he worked as a screenprinter at Studio 7. 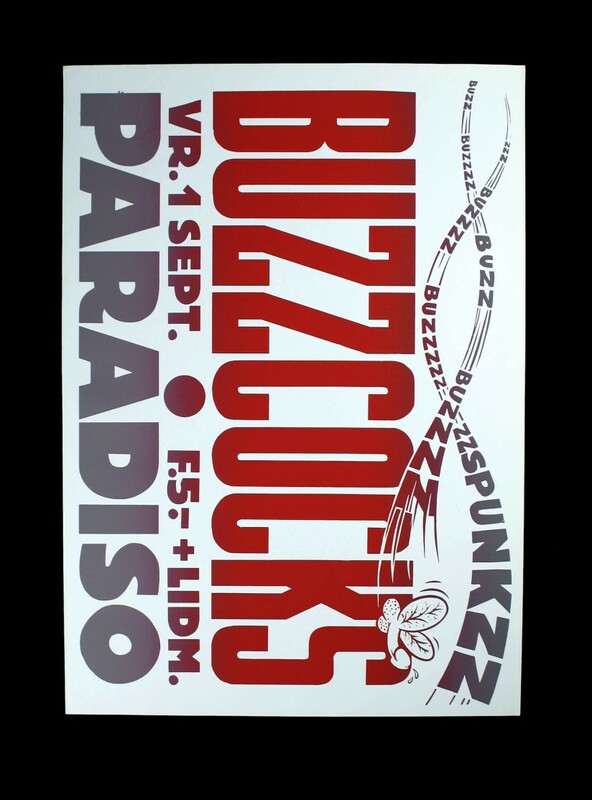 During the early 70s Kaye took up a studio in the basement of the famous Paradiso Club, designing posters for the club between 1972 and 1983. It was something of a cottage industry, and a one man band to boot, with Kaye cutting the stencils on film himself, printing the posters, and even posting them up around the city. His design and typographic style is very well regarded, utilising simple typography so that the posters could be clearly seen by people as they passed on their bicycles. In more recent times he has been subject to numerous retrospectives and has been cited as an influence by many- though sadly Kaye was killed in a street robbery in 1989. First hand examples of his work are extremely difficult to source, very few copies were made and most of the posters were posted up around Amsterdam, with very few surviving. In addition Kaye destroyed the stencils to re-use the screens for the next job.